The World Boxing Super Series took place in Glasgow on Saturday 3rd November. On a card that had several current and former champions appear there were also a few bouts that included some local boxers. One of these boxers was Kieran Smith who stopped his opponent within a minute. Smith is now preparing for his biggest fight yet at the end of November at the Emirates Arena in Glasgow when he faces Peter McDonagh for the vacant WBC International Silver belt. Boxing Insider spoke to Smith after his quick fire finish on Saturday against Pavol Garaj. Smith was happy to be a part of a big show like WBSS and explains why it was a long night for him. Saturday was a warm up fight before he faces McDonagh. 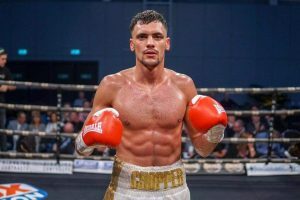 “Yeah, it was amazing to be part of such a big event in Scotland even though it ended up a long night for me because I was live float and did not get on until after main event, and as you say yes was a warm up fight but got change of opponent on Tuesday and I treat everyone the same, I never overlook anyone… one punch can change your career in this game. Did Smith expect a stiffer test? Having appeared on a massive show, there was only one highlight for Smith out with his own performance. Looking ahead to his fight with McDonagh, Smith only sees one winner. Smith has signed with MTK Global and he now sees the benefit of joining up with the management company, with his first-time shot. Smith explains why he is happy with his decision to join MTK. Who inspired Smith to take up boxing as a youngster? Smith aims to keep winning and to compete for more titles.